One of the more common rainforest trees are the 'Tulip Oaks', which are of course not at all related to the northern hemisphere Oaks. 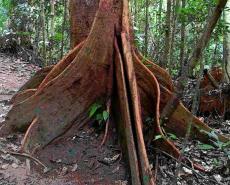 They have a distinctive ‘rocket ship’ shape to the trunk, with flanged buttress roots and a straight, tall trunk. The roots and trunk have a reddish shade. Every few ‘mast’ years there is an explosion of their distinctive seeds; small round seeds with a single large wing (pictured) that produces a whirled flight when released from the top of the tree. Many do not whirl that far, and the trees are often surrounded by a small carpet of seedlings.